Sometimes you have to go a long, long way to discover truths that are distinctly close to home. Over the last five years, I’ve done just that — left my home in iconically liberal Berkeley, California, and traveled to the bayous of Tea Party Louisiana to find another America that, as Donald Trump’s presidential bid has made all too clear, couldn’t be closer to home for us all. From those travels, let me offer a kind of real-life parable about a man I came to admire who sums up many of the contradictions of our distinctly Trumpian world. So come along with me now, as I turn right on Gumbo Street, left on Jambalaya, pass Sauce Piquant Lane, and scattering a cluster of feral cats, park on Crawfish Street, opposite a yellow wooden home by the edge of waters issuing into Bayou Corne, Louisiana. The street is deserted, lawns are high, and branches of Satsuma and grapefruit trees hang low with unpicked fruit. 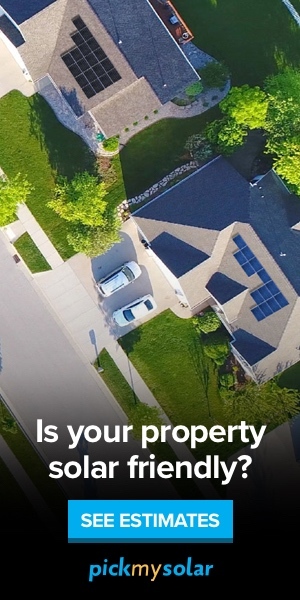 Walking toward me along his driveway is Mike Schaff, a tall, powerfully built, balding man in an orange-and-red striped T-shirt, jeans, and sneakers. He’s wearing tan-rimmed glasses and giving a friendly wave. After the disaster struck in August 2012, Louisiana Governor Bobby Jindal issued an emergency evacuation order to all 350 residents of Bayou Corne — a community of homes facing a canal that flows into an exquisite bayou (a river through wetlands) with white egrets, ibis, and spoonbills soaring across the water. When I visited in March 2013, Mike was still living in his ruined home. I had come to visit Mike Schaff because he seemed to embody an increasingly visible paradox that had brought me to this heartland of the American right. What would happen, I wondered, if a man who saw “big government” as the main enemy of local community, who felt a visceral dislike of government regulations and celebrated the free market, was suddenly faced with the ruin of his community at the hands of a private company? What if, beyond any doubt, that loss could have been prevented by government regulation? Because in August 2012, exactly that catastrophe did indeed occur to Mike and his neighbors. Louisiana is a classic red state. In 2016, it’s ranked the poorest in the nation and the worst as well in education, health, and the overall welfare of its people. It also has the second highest male incidence of cancer and is one of the country’s most polluted states. But voters like Mike have twice elected Governor Bobby Jindal who, during his eight years in office, steadfastly refused Medicaid expansion, cut funding for higher education by 44%, and laid off staff in environmental protection. Since 1976, Louisiana has voted Republican in seven out of ten presidential elections and, according to a May 2016 poll, its residents favor Donald Trump over Hillary Clinton by 52% to 36%. Mike was an intelligent, college-educated man with a sense of stewardship over the land and the waters he loved. Given the ominous crack in his floor and the gas monitor in his garage, could he, I wondered, finally welcome government as a source of help? And had the disaster he faced altered his views of the presidential candidates? It was then that he noticed that crack in his living room floor and heard a sound like a thunderclap. A single mother of two living in a mobile home a mile from Bayou Corne thought her washing machine was on, and then remembered it had been broken for months. Lawns started to sag and tilt. Not far from Mike’s home, the earth under the bayou started to tear open, and, as if someone had pulled the plug in a bathtub, the bayou began sucking down brush, water, and pine. Majestic century-old cypress trees crashed in slow motion and disappeared into the gaping mouth of the sinkhole then forming. Two clean-up workers had cast out booms not far from the sinkhole to contain an area of water shiny with oil. To steady their boat, they tied it to a nearby tree, which then slid into the sinkhole, as did their boat, though both men were rescued. In the following weeks, pristine swamp forest was replaced by oily sludge as the earth began to leak natural gas. “During a rain, the puddles would shine and bubble, like you’d dropped Alka Seltzer tablets in them,” Mike said. Gradually, gassy sludge infiltrated the aquifer, threatening the local drinking water. What had caused the sinkhole? The culprit was Texas Brine, a lightly regulated, Houston-based drilling company. It had drilled a hole 5,600 feet beneath the floor of Bayou Corne to mine intensely concentrated salt, which it sold to companies making chlorine. The drill accidently punctured one wall of an underlying geological formation called the Napoleon Salt Dome, three miles wide and a mile deep, sheathed in a layer of oil and natural gas. (One hundred twenty-six such domes lie under Louisiana’s land and water and are often mined for brine, with toxic chemicals sometimes being stored in the resulting cavities.) When the drill accidentally pierced the side of a cavern inside the dome, the wall crumpled under the pressure of surrounding shale, sucking down everything above it. The sinkhole grew. First, it was the size of one house lot, then five house lots, then the length of Crawfish Street. By 2016, it covered more than 37 acres. The pavement of the main road into and out of Bayou Corne began to sink, too. Levees along the bayou, originally built to contain rising waters in times of flood, also began to go down, threatening to extend the oily sludge over nearby grassland and forest. Meanwhile, shell-shocked evacuees doubled up with family members in spare rooms, campers, and motels, turning to each other for news of the expanding sinkhole. Mike was a water baby. He loved to fish and could describe the habits and shapes of a dozen kinds of local fish. He headed for the water as often as he could, although he got little time off. So “environment” wasn’t simply a word to him; it was his passion, his comfort, his way of life. Mike has long disliked the idea of a strong federal government because “people come to depend on it instead of on each other.” He grew up in a close-knit community not far from Bayou Corne on the Armelise sugarcane plantation, the fifth of seven children of a plumber and a homemaker. As a boy, he tells me, “I went barefoot all summer, and used to shoot crows with my rifle, use the guts for fish bait.” As an adult, he worked as an estimator, measuring and pricing materials used in constructing the gigantic platforms that house oil rigs in the Gulf of Mexico. As a child of the old South who grew to manhood in an era of big oil, he was for state’s rights and wanted even state government kept to a minimum. For a man who could lose himself for hours in his garage welding together parts of a two-seater Zenith 701 airplane from a kit, and who described himself as “to myself,” he welcomed the easy sociability of Bayou Corne. It wasn’t the simple absence of government Mike wanted; it was the feeling of being inside a warm, cooperative group. That’s what he thought government replaced: community. And why pay heavy taxes to help the government rob you of what you most prize? At a distance, we see a sign nailed to the gray trunk of a Tupelo tree: “DANGER, KEEP OUT, HIGHLY FLAMMABLE GAS.” Around it in the water are concentric circles of bubbles, scuttling outward like small bugs. “Methane,” says Mike, matter-of-factly. By mid-2013, officials had declared Bayou Corne a “sacrifice zone” and most of the 350 residents had fled. A small group of “stayers” like Mike were now criticized by the “leavers” who feared their presence suggested to Texas Brine that “it wasn’t so bad,” and so might lower the price the refugees could set for their suffering. Everyone knew that the company’s drill had caused the sinkhole, but that didn’t settle the question of blame. To begin with, Texas Brine blamed Mother Nature, claiming (falsely) that earthquakes were natural in the area. Then it blamed its insurers and the company from which it rented space in the dome. Both those who stayed and those who left were mostly angry at “the government.” For one thing, Governor Bobby Jindal had waited seven months before visiting the victims. And why was his first visit so delayed, he was asked, and why was it announced so abruptly on the morning of a mid-week day when most sinkhole refugees were at work? Like so many of his neighbors, Mike Schaff had twice voted for Bobby Jindal and, as someone who had worked in oil all his life, approved the governor’s $1.6 billion tax incentive program to lure more of that industry to the state. For three years, it was impossible to tell whether the oil companies had paid a penny to Louisiana since, under Jindal, the job of auditing their payments had been handed over to the Office of Mineral Resources, which has close ties to the industry and between 2010 and 2013 performed no audits at all. In Louisiana, on-the-books environmental regulations were laxly enforced by conservative state legislators many of whom were oilmen or, like Governor Jindal, took donations from Big Energy. An eye-opening 2003 report from the Inspector General of the EPA ranked Louisiana last in its region when it came to implementing federal environmental mandates. Louisiana’s database on hazardous waste facilities was error-ridden. The state’s Department of Environmental Quality (a title missing the word “protection”) did not know if many of the companies it was supposed to monitor were “in compliance.” Its agents had failed to inspect many plants and even when it did find companies not in compliance with state regulations, it neglected to levy or collect penalties. The Inspector General was “unable to fully assure the public that Louisiana was operating programs in a way that effectively protects human health and the environment.” According to the state’s own website, 89,787 permits to deposit waste or do other things that affected the environment were requested between January 1967 and July 2015. Of these, only 60 — or .07% — were denied. Louisiana was, it turned out, in good company. A 2012 study by sociologist Arthur O’Connor showed that residents of red states suffer higher rates of industrial pollution than those of blue states. Voters in the 22 states that went Republican in the five presidential elections between 1992 and 2008 live in more polluted environments. And what was true for Red States generally and Louisiana in particular was true for Mike himself. Looking into exposure to toxic waste, my research assistant Rebecca Elliot and I discovered that people who believe Americans “worry too much about the environment,” and that the U.S. already “does enough” to protect that environment were likely to be living in zip codes with high rates of pollution. As a Tea Party member enmeshed in the Bayou Corne sinkhole disaster, Mike was just an exaggerated version of a haunting national story. “Hurricane relief,” he finally responded. He paused again. “The I-10…,” he added, referring to a federally funded freeway. I ask about the Food and Drug Administration inspectors who check the safety of our food. The military in which he’d enlisted? And then the conversation continued about how we don’t need government for this, for that, or for the other thing. Mike and his wife had recently moved from their ruined home near the sinkhole into a large fixer-upper on a canal flowing into Lake Verret, some 15 miles south of Bayou Corne. At nights, he can hear the two-toned calls of tree frogs and toads. He had jacked up the living room floor, redone the bedroom molding, put in a new deck, and set up his airplane-building kit in the garage. A recent tornado had ripped the American flag from a pole on that garage, although it hadn’t harmed the Confederate flag hanging from the porch of his neighbor. Mike loves the waters of Louisiana more than anything in the world. A vote for Hillary Clinton would protect the Clean Water Act, secure the EPA, and ensure that government would continue to act as a counterbalance to the Texas Brines of the nation. But there was one thing more important to Mike than clean water: pride in his people. He had struggled hard to climb out of the world of a poor plumber’s fifth son, to make it to a salary of $70,000 a year with a company that built oil rigs, to a third and at-last-right wife, and to a home he loved that was now wrecked. At the entrance gate to the middle class, he felt he’d been slapped in the face. For progressive movements from the 1960s on — in support of blacks, women, sexual minorities, immigrants, refugees — the federal government was, he believed, a giant ticket-dispensing machine in an era in which the economy was visiting on middle-class and blue-collar white men the sorts of punishment once more commonly reserved for blacks. Democrats were, he was convinced, continuing to make the government into an instrument of his own marginalization — and media liberals were now ridiculing people like him as ignorant, backward rednecks. Culturally, demographically, economically, and now environmentally, he felt ever more like a stranger in his own land. It mattered little to him that Donald Trump would not reduce the big government he so fervently wanted cut, or that The Donald was soft on the pro-life, pro-marriage positions he valued, or that he hadn’t uttered a peep about the national debt. None of it mattered because Trump, he felt, would switch off that marginalization machine and restore the honor of his kind of people, of himself. Mike knew that liberals favored care for the environment far more than Republicans, Tea Partiers, or Donald Trump. Yet, despite his lost home in a despoiled land, like others of his older white neighbors back at the Bayou and here in the Basin, Mike was foursquare for Trump; that’s how deeply his pride was injured and a measure of just how much that injury galled him. What would Trump do to prevent another calamity like Bayou Corne with its methane-drenched mud, its lost forest, its dead fish? He has been vague on many of the policies he might pursue as president, but on one thing he was clear: he would abolish the Environmental Protection Agency. Arlie Hochschild is the author of many books, including The Second Shift and The Time Bind. 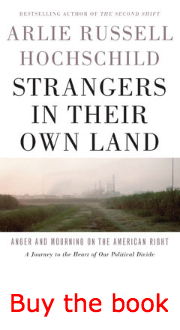 Her latest book, Strangers in Their Own Land: Anger and Mourning on the American Right (The New Press), will be published in early September. This essay is adapted for TomDispatch from that book.